How to draw a KV-2! Hello! 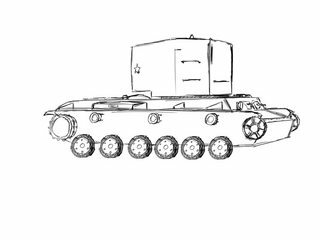 I've seen a couple of attempts at sketching out or drawing up a tank, I thought I'd show my own process of drawing a tank to see if it might help others. For my first, I thought I'd start with a KV-2. Easy tank, straight edges, much square, very stronk. Should be a cinch to draw, and get perspective down. 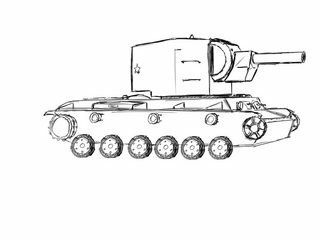 And who doesn't want to try their hand at drawing a KV2? 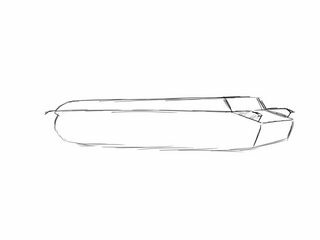 So I start out by drawing a basic, lone hull. To get an idea of the perspective and to give me something to work off of for the rest of the tank. After copying the road wheels(yep, just copy paste, THANK you Photoshop) I finish the fins and add some details to the front of the hull. On top of that, I get started with an outline of the turret. I erased it and redrew it a couple of times until I got the perspective right- this is all down to how good you want it to look. 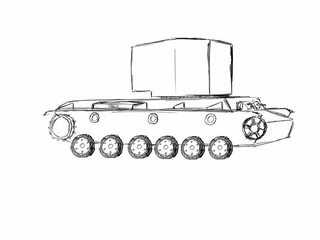 So now- as you can see I've added some details to the turret- but what's important here is I've added lines on the front- this is the reference I'm using to start drawing the assembly of the gun on the front. This step is entirely the gun. 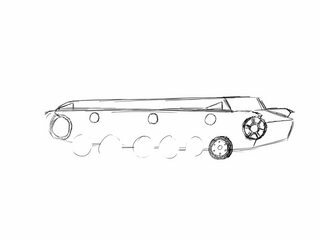 How you go about drawing it is mostly up to you- how I did it was draw the half-cylindrical dome-bit the gun extends from first, then draw the gun spring housing(the squarish-bit on the half-cylinder) and then the gun itself... just a neat barrel sticking out. Here I've added a guide line for me to make the tracks. Here's the tracks completed, with a bunch of other details added, including the torsion bars and the tow-hooks on the front. The finished drawing! 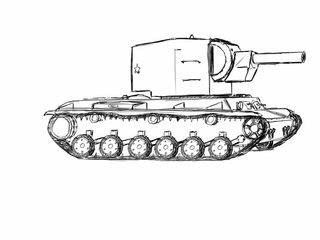 Of course after you finish the KV-2, whatever you do with the drawing is up to you. I chose to try shading it a little bit(which I'm totally fail at) and add a neat stripe on the turret. Hope you enjoyed the little step-by-step guide here... and if you'd like to see another, feel free to request one in the topic. It may or may not happen(I have finals right now), so just be aware of that. If you would like to access these pictures full size, the album can be found here. any chance OP can do the ELC AMX next? What program did you use to draw these pictures? It looks like you used a pencil or marker to do it instead of the mouse. I guess this'll be my next if I find the time. Pretty cool tank to draw too. 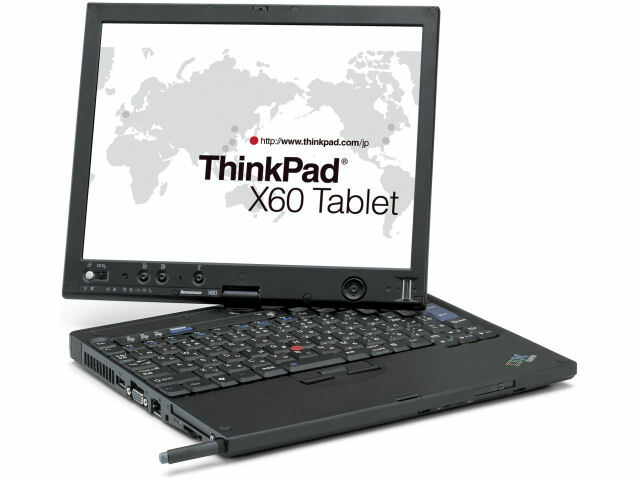 It's Photoshop, but I'm drawing on one of these, using a stylus. It's got a Wacom Digitizer behind the screen. I draw like this as it's very similar to drawing on paper, in case anyone here was actually trying that. Edited by Medessec, Apr 29 2015 - 09:37. Now can you draw a KV-2 whose Machinegun port has been replaced by a hull mounted 152mm gun? Draw me like one of your Soviet Comrades.